Translations: Super Robot Wars A Portable - 100% translated! To celebrate SRW A Portable's 10th anniversary, this is a full translation of the game into English. This translation was born out of friendship, respect for the original work and their authors, and love for Super Robot Wars and their related anime series. Over the 5 years of the project, the Steel Soul team tried to build a translation that would convey the original experience - in the story, in the graphics - to English speakers. They sincerely hope that you enjoy your time with A Portable, even if it comes kicking you hard with its difficulty! - Thanks to AGundam, MrWorm, Sporky McForkinspoon, MarsRaven, cj_iwakura and others for their interest and helps here and there. During the robot selection, one may notice that the robot commonly known as "Ash Savior" has been renamed "Aschenretter". Steel Soul wanted to share an explanation of the reasoning behind the change. This stems from another name change: the Weiss Savior, renamed to "Weissretter". 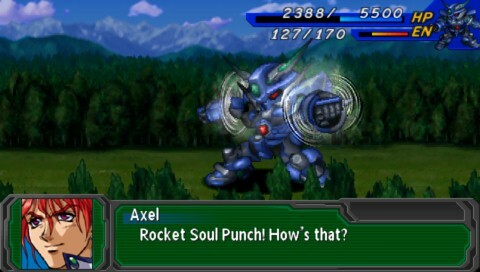 This robot comes from Super Robot Wars OGs (it was not featured in the original GBA release), as a parallel to Excellen's Weissritter. It just so happens that "Savior" translates to "Retter" in German, so it seemed interesting to make the parallel between the two names even more evident by making them share the same name convention (Excellen's Weissritter and Lemon's Weissretter). Now, with the Savior part changed to Retter, the basic robot name had to be changed too, to match the new naming convention, so Ash Savior was renamed to a full German name: Aschenretter. It being a playable unit, one can still opt to rename it "Ash Savior" during robot selection, according to preference. - Jack King (from Getter Robo) is meant as a very stereotypical American, in Japan. His original lines tend to be hard to understand because he uses a lot of gratuitous Engrish. To convey that in translation, it was decided to play his "Texas" origin up, giving him a heavy Southerner's accent during editing. - Regarding Lamia, the portrayal of her speech quirk deserves an explanation. In the Atlus release of OG2, her speech problem was portrayed as a stutter, something that opinion doesn't really work in the translator's opinion (why would the other characters call it a weird accent, or think she's trying to be funny?) In the original Japanese script, Lamia has a "bug" in her speech function, which makes her polite speech ("keigo" in Japanese) come out wrong, with redundancies within words and awkward phrasing overall. It was decided to write this quirk as a mix of awkward words positioning, and inserting made-up words created by mixing two different words of similar meaning. This way, it seems like she's trying to sound polite, formal or cultured while failing miserably, which suits the reaction of those who listen to her. - Using a Japanese "intermission" save will actually prevent some texts from being translated (as they come from the save itself). "Continue" (suspend) saves from the Japanese games will probably have undesired side-effects. - Savestates from the Japanese game won't work properly (as the memory layout is different). - Hacks to give yourself more money, skills and others may or may not work. - The save editor still works, although it is unable to render text properly or let you rename your hero & robot in a way the English game likes. - Renaming heroes and their robots is more restricted than it would be in modern entries in the SRW series, and entering a long name can result into a "bad display of text". The game will assume the name is less than 80 pixels, and the number of characters in the name is limited, but the game doesn't check the pixels at the time you rename heroes/robots, so it's up to you to be reasonable. - The "Gundam Deathscythe Hell" has the hell of a long name. The team couldn't get themselves to use an abbreviation for it, so it does "overflow" out of the small status box at the bottom of the screen when the cursor hovers over it. - Puru appears after Puru Two in the Pilotpedia. Black couldn't find how to change that, though that shouldn't prevent anyone from enjoying the game. - A unit that is underground will be offered to surface with a menu item that reads "Land" (like it would for a flying unit). While this isn't elegant, there are few units that go underground and we wanted to keep a verb here (rather than going with "on surface" or things like this). It's still fairly understandable. - The combo attack "Darkness God Finger" has Domon's line incorrect (as it is the same line in Japanese for another attack). It still sounds cool, though. If you have a fix for this, we're interested! - This translation has been tested on PSP "fat" with 6.60 ME-1.8, PSP-2000 with 6.60 PRO-B10, PSP 3000, and the ppsspp emulator. Other setups may or may not work. - Like the original game, the Counter skill item doesn't really grant thepilot who uses it the Counter skill (although the Pilot will list it in his/her skills). Black couldn't find a fix for this - do let the team know if you have one! - The battle animation for the Stoner Sunshine has Shin Getter Robo split into Getter Robo machines instead of their newer counterpart. - The battle animation for the Dendronium's large beam saber uses red, instead of pink. As a first game translation ever, this project has been an interesting challenge for Black. He thrived to give the best quality he could - even with limited assembly skills. In all honesty, this has been a great learning exercise. The game is overall on the "easier to get into" from a programming side, thanks to its being on the PSP (which offers a great emulator with debugging capabilities, has known graphical formats, has known assembly toolchains and whatnot), and thanks to its internal structure. As a sharing of experience with others, Black would like to mention that he set out hoping for this to be a project for "2 years or so". It ended up as 5 years, and they felt very busy, for the most part, turning both the translator and programmer into no-lives. But they were great, and Black strongly believes that this translation reached this state thanks to the great relationship that was established and entertained. This is a prety big game, when one thinks about it: 58 missions, 26k lines of story text, 13k lines of battle quotes, 7k short lines of other text, 490+ weapons, 428 mechs, 88 playable characters among a cast of 199, 61 musics. So that would count as 2 takeaways: always care for the people in your team, and don't ever think you understand how long the project will take. Black hopes the friendship shows through in the translation. Re: Translations: Super Robot Wars A Portable - 100% translated! Amazing. Every SRW Project that makes it is a special achievement unto itself. Huge thank you guys for your hard work This is amazing! Thank YOU for the hard work!!!!! As a newbie of SRW, anyone recommend a good starting point? In terms of older SRW, I'd say J on GBA. A is pretty crazy at times, I hear A Portable is even moreso. If you're willing to throw down money for a newer offering, V and X are good bets on PS4. Hey, congrats on getting this monster of a project done! Been lurking this one for the last 4 years checking up on updates. The villain in this game has always been one of my favourites for the SRW series. However, I've uh, ran into a small issue. Your ReadMe file said to report if it you tried it on a Mac so I'll let you know what I'm running into. I have the downloaded patch. I have my iSO sitting on my desktop. I tried Multipatch as always with Mac patching. It sees the patch fine, it sees the iSO fine. I try to apply it and I get "Patching failed Decode error: -17710" which then crashes MultiPatch and makes an iSO with zero bytes. I tried putting the iSO in the same folder at the patch as I've read that can sometimes make a difference, no change in outcome. I've done this before for PS1 games, but this is my first time trying to apply it to a PSP game. I made sure that the iSO file was named exactly what you had put it down as in the ReadMe. Using the xdelta version as MultiPatch doesn't recognize the .bats. I have MultiPatch up to date at 1.6.2. It supports .delta and .dat, I don't know if the .xdelta file is different enough to be the problem but it shouldn't be based on everything I've read. Not sure if any body else out there has a Mac and can give this a shot to see if its a consistent error. I second SRW J....SRW 3 from SNES is crazy hell difficulty(and the one I started ROFL) SRW alpha gaiden for PS1 is hard too especially if you are going after the true ending...not as hard as 3 but still hard....I heard this one here is pretty difficult I saw someone playing mid stages with NORMAL enemies all having Mini bosses HP like 40k and High evasion...they said in SRW A portable you cant save and then load to change the percentages from a enemy attack...but someone said in gamefaqs there is a way around(i guess it involves turning down the PSP and loading again in mid battle). I tried using Multipatch on OSX, but it just led to an error message. Delta Patcher did work when using WineBottler, though. The patched ISO loads up fine on a PSP Go running 6.60 PRO-C2. Either Gaiden on SNES or OG 1 and 2 on GBA. If you're looking for the gundams and such though, J is a good point. Can't thank you enough for this. Is the name "Londo Bell" actually accurate? I just asked because "Rondo" seems kinda good for another interpretation of the Romanji word. I'm running the game on PPSSPP and right before the first fight on Chapter 1 the emulator crashed and showed a pop up with the words "Bad vShader was cached". What happened and how do I fix this? This also appears to occur with the raw unpatched .iso, so perhaps emulator settings related. Congrats to all involved in this! Great! After all those years,to finally see this game translated and to be able to play it properly...i can't thank you guys enough for this.Gonna play it right away.I love this game! Thank you very much,everyone! And BTW, for those feeling that this game is too hard, remember that this is one of the rare SRW games which comes with the "Game Over Glitch" (debatably a glitch, but that's how it's called). As in, after every Game Over, the scenario automatically restarts without booting back to the Title Screen, and thanks to that a few things that you got from before it are kept in, as long as you don't reset. Unfortunately here on A Portable, that only applies to money. So no, can't grind levels here. So really, no disadvantages whatsoever on losing! ...Which is kind of a merciful thing against certain bosses like Don Saucers...! Congrats for finishing the translation! You're awesome!! Btw, in terms of canon, Axel's route is Real + Aschenretter and Lamia's route is Super + Angelg, right? Wanted to make sure since I don't really understand the flow chart. Hard to say. 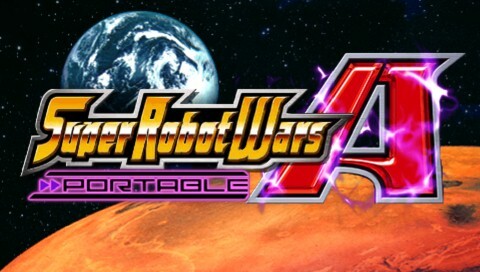 SRW A is more or less a stand-alone game, so anything can be canon. But in the SRW OG 2 amnesia-less Axel's mech is Soulgain, while Lamia pilots Angelg with a semi-secret way to get an Aschenretter (Ash Saber/Saver/Savior) or Vaisaga. In the later OG games Vaisaga is the Lamia's default mech in the OG-verse, as far as I know. Can confirm, Soulgain is Axel's canon mech, and Angelg is Lamia's. Vysaga is kind of their emergency substitute... Which is ironic, because as any SRWA/AP veteran will tell you, Vysaga can outperform them both, easily.